The SFU students had a few days off and went to Nadi village above the McLeod Ganj area (higher than upper Dharamsala. We attended The Dalai Lama's teaching. We sat with a large group of monks and nuns. His Holiness's teaching was taught in Tibetan language and we had no clue what he was saying until some monks shared their radios and headsets with English translation. His teaching was very good and I took some notes (though the translation was not very clear). A few of us went hiking last Saturday with Chok, our Tibetan language teacher. 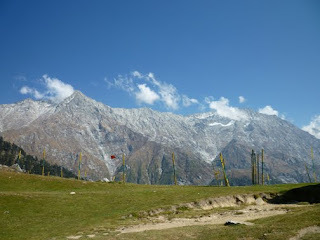 The hike was called the Triund Ridge and we left at 4:30am. We had to take a taxi up to meet Chok near a Hindu temple (Galu temple). Our taxi had trouble climbing the rocky, steep hill so we had to get out so the driver could get the car up. We started walking in pitch dark and an hour later we saw the beautiful crimson sky at the start of the sunrise. The temperature was chilly as we were close to 7,000 feet in elevation. As the sun came up, we passed a large herd of sheep with many baby lambs...so cute! It took us only 2.5 hours to get to the ridge and we were at awe when we saw the mountains. Ten years ago, the mountain tops had glacial ice but unfortunately, we saw clear evidence of global warming as the glacier had diminished to only a small patch. 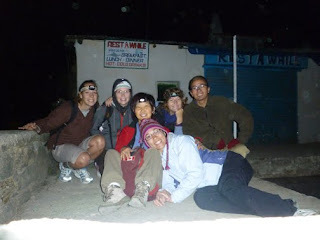 When we arrived at the ridge, we saw tents, tea shops, people having breakfast and even a guest house. Of course we had to have tea and it was the best masala tea that I've had in India so far! We even practiced some yoga moves to stretch our muscles. The environment reminded me of Joffery Lakes near Pemberton. We spent five hours up there had a great time talking and learning from Chok. He had been a monk for 10 years but was disrobed after he went to France and experienced his first temptation. He shared some Buddhist philosophy and told us about Tibetan debating skills (really cool that all Buddhist monks learn how to debate to enhance logical thinking skills). Laurie Wong, a Bachelor of Physical Education and Coaching grad, is in India with the Professional Development Program (PDP) at SFU as part of the International Teacher Education Module. She will be filing stories for doug during her adventures in India – stay tuned.